The Level pens offered by Pelikan are something of an anachronism. While the external styling is definitely in keeping with the 1990s, the sensibility of the pens is firmly rooted in the 1950s, and the mania which took the pen world in that decade for mess-free, convenient fillers. The arrangement on the Levels is precisely in this vein, and as happened with the capillary-filling pens or Sheaffer’s Snorkels the effort to remove the “problems” associated with more conventional fillers generated a whole new set of gremlins. The Level does not use cartridges, those winners of the convenience wars of the ’50s. It could be said to not have a built-in filling mechanism at all, despite the presence of stuff in the barrel connected with filling. To fill the pen, one requires a special bottle, with an arrangement something like the valve in a tire built into its cap. This interfaces with a valve in the tail of the pen, so when the bottle is squeezed it injects ink into the barrel. 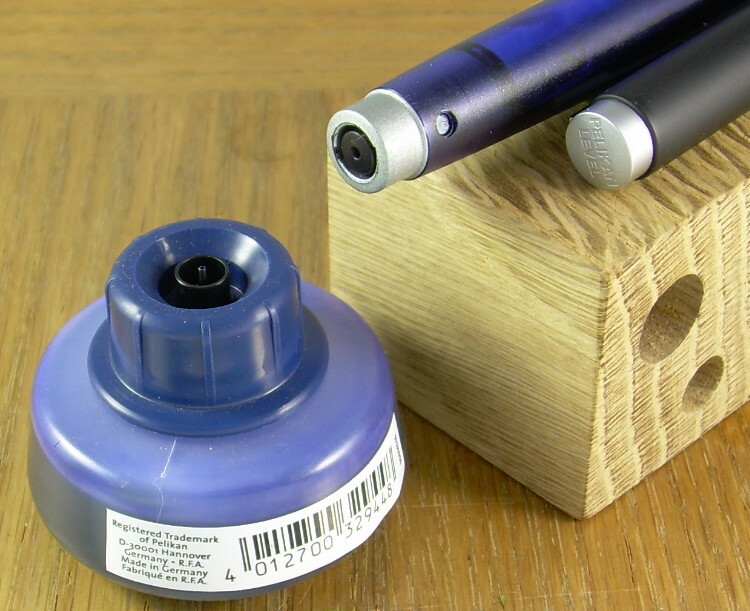 The cap stays on the pen, the cap stays on the bottle, and ideally all ink movement is internal so there is no wiping. One need not even take off the cap for the filling. There are actually two chambers in the barrel, separated by another valve, an arrangement which allows the pen to carry a vast quantity of ink without the usual worries one has about expansion in an eyedropper style of pen. The writing chamber has the same volume as an average cartridge, which is not enough to cause expansion dribbles. When that chamber runs low, one turns a knob on the pen’s tail which drives a rod forward, moving an O-ring and allowing communication between the front of the pen and the big reserve chamber in the back. There is a stopper on the front end of the rod which occludes the feed while the ink transfer is happening, reducing the chances that a pressure build-up in the reserve chamber will cause dribbling. Sounds pretty good, eh? It’s all excellent theory, but there are some practical aspects where the Level, like its predecessors of that previous generation, rather stumbles. The most obvious point of agreement between Level and the older pens of convenience is that it is essentially impossible to flush the main feed channels without a complete dismantling of the pen; even if one has a spare bottle to put water into, the way the chambers seal renders moving the water from fill-point to feed something like the old river-crossing puzzle, and the water will only come out under regular pressure. Only the Waterman X-Pen is more resistant to cleaning, and that only in the cases where the section is glued to the barrel. This also means that it is very hard to change which ink the pen is using. There is also the problem of actually filling the pen. The official instructions suggest an ease which is hard to achieve; I’m fairly comfortable with the act of filling a pen, and my first attempt saw me blue up to the wrists. The bottle must be firmly held against the pen during the whole process, as a partial loss of contact makes for mess. I found that if the pen is perfectly vertical, there are also problems with ink not going into the pen, and if one squeezes too firmly ink can actually get around an O-ring on the tail unit. There is also the matter of that specialized bottle, without which the pen cannot be filled. What if it is lost? What if it breaks? What if the doings in the bottle’s cap clog up? And then there’s the question of containment. The seal in the tail of the pen is apparently a piece of “self-healing” silicone rubber, which must have a point at which it fails to recover from being forced open by the dull syringe of the bottle… and that seal is between a hole in the tail of a pen and a lot of ink, rendering the wearer of the pocket it is in rather nervous. If the knob is turned to transfer ink from one chamber to the next with the point upwards, the reward is a small dribble out the tail-hole. Too vigourous a shake, as the instructions suggest for a feed that hasn’t wetted fully, and there’s also a chance of ink from the hole. Between that hole and the possibility of having got ink between barrel and tail unit with an over-enthusiastic squeeze of the bottle, one has a mess-free pen with a very high potential for mess. Interestingly, the Level was first offered as a student pen, the model number of which was either L1 or L65; the description differed with which market it was selling in, although I haven’t found a definitive map for which was where. Whatever number it goes by, it was in the looks department a quintessential student pen, at least as such things are known in Germany; in general proportions it was quite similar to the Lamy Safari. Oddly, it did not have any finger-directing sculpting in the section. All examples have a grey barrel, with colour showing in the cap, section, and tail mechanism. One assumes that the idea was to give the student a pen which they wouldn’t be too frequently distracted by– refilling at home, carrying enough ink for several days’ notes, only infrequently needing an internally conducted recharge of the writing chamber, and having very limited options for being taken to bits rather than listening to the teacher. The very broad top of the cap also allowed the pen to stand by for use with the point downwards, ensuring a ready, damp feed. The following year, Pelikan released the Level 5, with substantially different appearance meant to bring the pen into the adult market. The barrel remains transparent, but is frosted. The cap becomes cylindrical, the L65’s being more of an inverted cone, and gains a rather good spring clip. That clip has no foot on it, but a flat inner face that presses against a couple of hemispherical studs on the cap itself to hold onto a pocket; this strikes me as an approach that is very kind to the fabric of the shirt. Unlike the school pen, the cap of the Level 5 cannot be posted on the pen’s tail. There were several levels of trim in this model, and it came with a rather decorative ink-stand one could, if so inclined, leave the pen socketed into when not in use. I’ve only had a Level 5 in hand, so my appreciation of the breed is based on that. Mine is a steel point, like the Level 65, and it offers wonderfully smooth writing; we may assume the gold points are similar. Even though it cannot be used posted, it is large enough that this does not render it uncomfortably short for the average user. If it were not so proof against cleaning, and didn’t present such a looming menace of ink stains, I would recommend this pen to anyone. As it stands I’m afraid it’s as much of a curiosity as a capillary filler, although it did manage to remain in production for nearly a decade. Production Run: 1996 – 2006; the Level 5 did not appear until 1997. Cost When New: I currently only have Japanese prices from 1999/2000 for the almost the whole line– ¥3,500 for the L65, ¥10,000 for the L5 Black (base model), and ¥23,000 for L5 Silver (14K point), which leaves out the L5 Ceramic with 18K point and ceramic cap. These work out to about $32.00, $92.00, and $212.00 respectively, but as the prices are for Japan that includes some tariffs. The same informant has a price tag for the L5 Black of €75, and the Euro was about on par with the US Dollar at that time; assume for the moment that a proportional adjustment be made to the other model’s prices (for current value, try this calculator). Update: The price list for 2000 shows the Level 5 at €178.95, €132.94, €107.37, and €66.47 at the various trim levels (respectively $168, $125, $95, and $62, approximately). Size: Level 5 -14.5 cm long capped, 12.4 cm uncapped; it cannot be posted. Point: Steel on the L65, while the L5 might have steel or gold in either 14K or 18K depending on the trim. Filler: One might say “proprietary mechanism eyedropper.” Level 5 capacity approx. 1.0 ml in the forward chamber, 2.5 ml in the reserve, for a theoretical total of 3.5 ml. These are more approximate than my usual measurements, because they were done by pouring water into the barrel with the mechanism removed, letting it dribble out the point, and making estimates on how much space the absent guts would take up and when the level of the fluid was actually at the limits of the available interior space. Pelikan Level 5 Black, ready to go but for ink– and you’ll never see it this clean again. The only marking on it in this state is the point impression. Capped and ready for filling… once the end knob is rotated about ninety degrees. That stud below the clip is a third and purely decorative one in a line of three; the other two under the clip have actual utility. Bottle and pen, ready for docking. The cap need not be off for this, but I wanted to show the impression on the top.